The little toy train has chugged its way up the curving incline and come to a standstill at Castle Hill, the protected 19-hectare park, from where you can look down on a view that exudes sparkle and serenity at the same time. 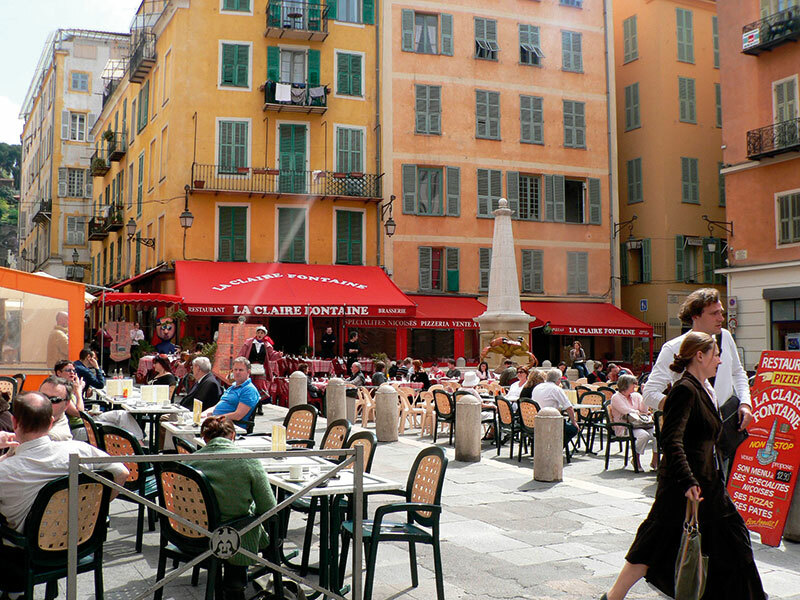 Capital of the Côte d’Azur and fifth largest city of France, NICE exults in its exceptional microclimate and panoramic location in the heart of the French Riviera – the idyllic setting that nudged the brushstrokes of painter Henri Matisse in 1917, causing him to stay on until the end of his life. Strolling back towards the gently changing hues of the blue-green Mediterranean, our little group pauses at the famed Cours Saleya in the Old Town. This legendary market square, brimming with exotic blooms and fresh farm produce in the day, is a master of masquerade. On Mondays, the vibrant street, also home to amateur singers, becomes an antiques marché and every evening from June to September, it transforms itself into an arts and crafts bazaar, with angst-ridden artists draped around their works. Off the main square, among the charming, little shops that spill forth with multicoloured pottery, trendy shoes and hand crafted lamps, is La Cure Gourmande, the confectionery magasin, highly rated for its petits biscuits and almond toffees. Armed with boxes of sinful, sugary delights, we quicken our pace to keep a lunch appointment at noon. The French, we discover, eat early. Dominating the skyline of the sea-fringed Promenade des Anglais, the 1913-built, historic Hotel Negresco is the stuff movie scripts are made of. It was here, on a bar stool that acting doyen, Richard Burton absentmindedly left an emerald necklace he was to gift to then wife, Elizabeth Taylor! And it was here, in the magnificent Salon Louis X1V that venerated pianist, Arthur Rubinstein spent the night, pampered with blankets and champagne, when he refused to climb four floors during an electricity cut. Queens, kings and presidents have been celebrated guests of the hotel which was pulled out from post war oblivion and loss by Madame Jeanne Augier in the late ’50s. We even bump into the perfectly turned out 80-plus matriarch who has personally transformed the hotel into an art museum of sorts with a mind-boggling collection of canvases and sculpture. As we sip our Catherine blossoms and frosty limes and await the spread of homespun salade niçoise, smoked salmon lasagna, veal blanquette and the classic crème brûlée, master crafted by chef, Bruno Turbot, we are informed that it was in this carousel-style brasserie, La Rotonde, that Hollywood actor, William Holden wooed a waitress for two weeks till she agreed to accompany him on a world trip! The afternoon, being ours to explore, takes us on a trail of paths that ring with the opulence of La Belle Epoque and the minimalism of New Age – the onion-domed Russian Orthodox Cathedral, said to be the finest Russian church in Western Europe, the passionate rendering of the Château des Ollières, now a boutique hotel, the Sacha Sosno-designed imposing square head, housing the Louis Nucéra library, Bernar Venet’s monumental open air L’Arc 115º5, the award-winning Acropolis Convention Centre…. Skirting the blocked off areas which are being readied for Nice’s new tramway system to be launched in 2007, we are soon driving out of the city, past affluent residential areas towards the languorous coastline of Saint-Jean-Cap-Ferrat, lined with sprawling villas and sleek yachts, sumptuous haven for the likes of Giorgio Armani and Bill Gates. Nestled in the folds of a rugged hillside, is the medieval village of Eze, where art marries old-world pomp in the pricey craft shops and heritage hotels that spring out of orange tree-fringed squares and boast clear views of azure waters romancing the white cliffs. Dinner is a surprise. Even for Nice resident and friend, Ria Kolembusova, whom we follow into the warm-toned interiors of the newly-opened Voci ( voices ) on Boulevard Victor Hugo. The courses of Mediterranean platters are served with a flourish by waiters who could pass for rock stars and then, they actually begin to sing! Superb opera to the accompaniment of a live libretto, in a setting, designed to resemble a theatre. Owner, Franck Le Goff, between clearing tables and lapping up plaudits, shares his dreams of opening more such restaurants for music lovers, while urging us to visit his other eatery, Taj, serving ‘traditional samosa gosh and murgh adrak,’ at Valbonne, a picturesque village near Nice. Another sunny morning and we are absorbing the cool, surf-splashed La Croisette from Caffé Roma, opposite the famed Palais des Festivals, while we watch Nice’s neighbour, CANNES, recover from the onslaught of more than 11,000 MIP TV (world’s audiovisual and digital content market) delegates and spruce itself for the forthcoming international film festival. In a rediscovery of sorts, I insist we stride up the zigzag lane of Le Suquet ( the Old Town ) to pop in for a drink at the 19th century Auberge Provençale, the oldest restaurant of Cannes, frequented by the likes of Sean Connery and Catherine Deneuve. On the stroke of nine, we find ourselves rubbing shoulders with a funky, cow sculpture (in blue!) at the themed, boutique hotel, 3.14 (the 3 resembling an Om), and exchanging greetings with owner, Karine Ellena-Partouche, who hails from the family best known for their high profile casinos in Europe. 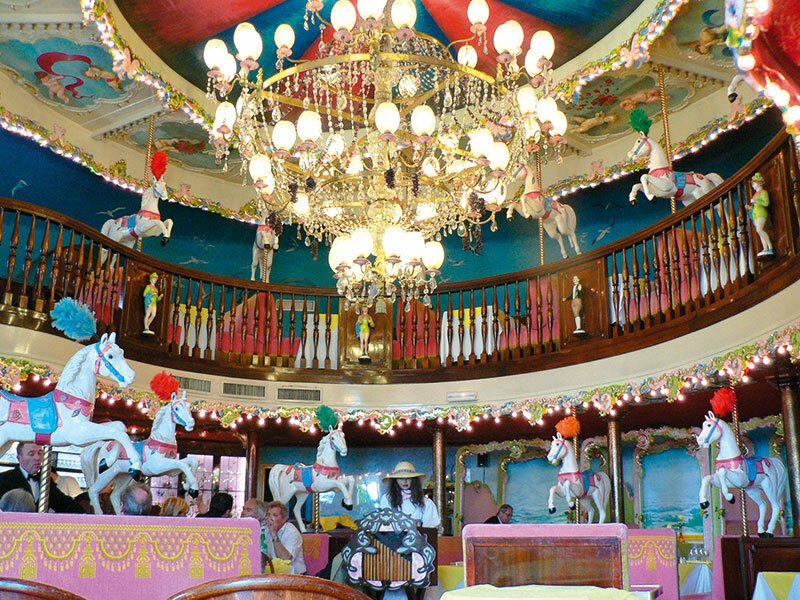 The 3.14, in its second year, is a hotel that plays with colours and moods and dormant fantasies. Five residential floors are decorated with the inimitable nuances and scents of five continents, all propelled by the elements of Feng Shui. If you fall madly in love with the crazy cane chair or the palm-shaped settee, feel free to buy! Tonight’s theme is ‘Fairy’, so a gamut of winged creatures and feathers-outfitted staff float past us, bearing margaritas on trays, as we settle around Davide Medri-designed tables in the Murano glass-encased lounge bar-restaurant, Mahatma. The affable chef, Mario d’Orio guides us through a sensuous Mediterranean meal, spiked with spices – foie gras and wine caramel, roasted sea-bass with fennel, grilled dover sole, scallops in pistaccio crust, washed down with flutes of bubbly and topped with Italian tiramisu and amaretto ice cream. The manner in which we totter back to our hotel deserves a separate telling! On the last leg of the blindingly blue Côte d’Azur, we cruise along the sinuous coastline of SAINT-TROPEZ, touted as the ancestral home of the G-string bikini. 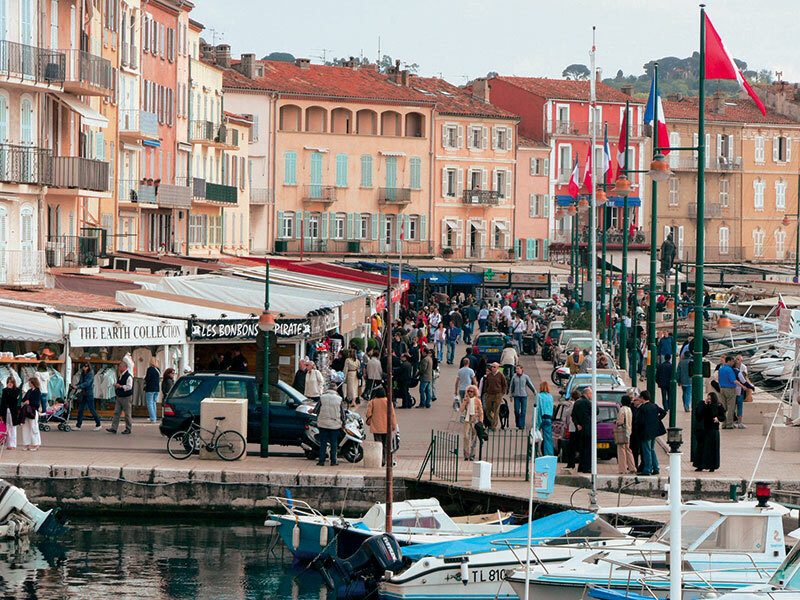 A nondescript fishing village that bloomed around a port founded by the Greeks of Marseille, Saint-Tropez was for long an unspoilt hangout for post-Impressionist painters, till former bombshell, Brigitte Bardot put it on the celebrity hideaway map. 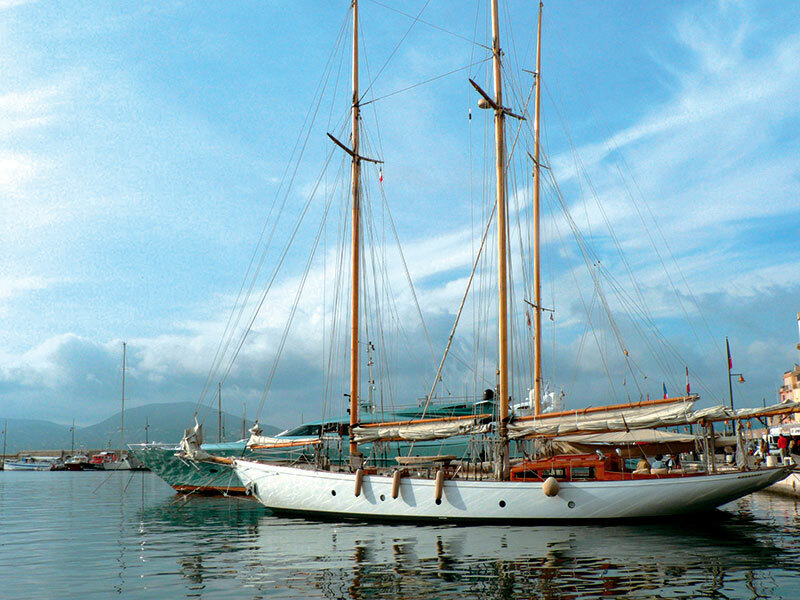 Bardot may have since shed her furs and is dedicated to saving the animals, but summer in Saint-Tropez is a hedonistic celebration of upscale boutiques, antique thingummies, luxury yachts and burrowing in the sand on the five km-long Pampelonne beach. In the looming presence of the 16th century citadel, a sea of paparazzi hasten forth as a ritzy boat slides into the port. And ever curious, we pause in our tracks. 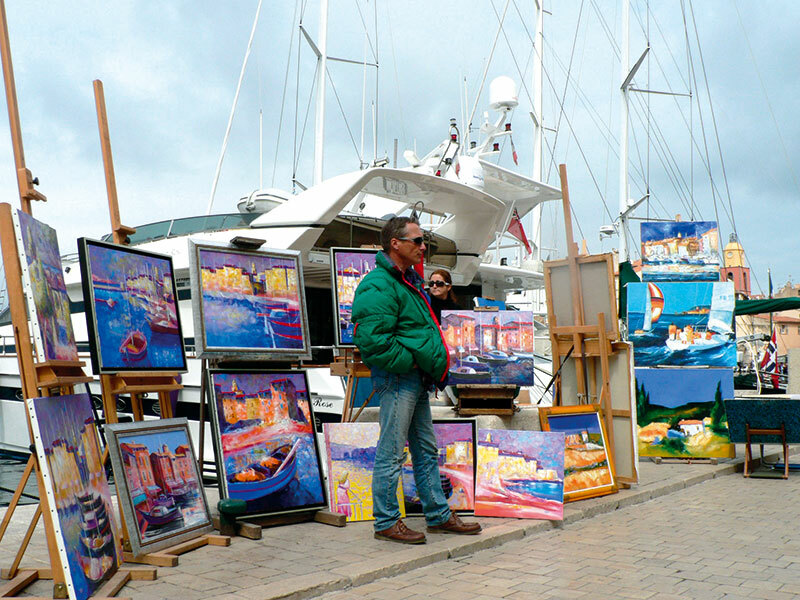 But there is no sign of regulars, David Beckham or Pamela Anderson on board, so we walk on to see the artists at work. This is an art gallery worth visiting – canvases on the waterfront, catching the light of the sun and encompassing the sound of the waves, with gentle-eyed painters explaining their works and posing playfully with their brushes. For streetside ware, prices seem steep at first, but a little friendly bargaining and you can frame a freshly painted watercolour on your wall. L’Auberge des Maures, draped in deep hues of pink and red is where we are treated to our first all-vegetarian, authentic Provencal meal in the company of India lover, Sandra Philippe and hotelier, Jean-Remy Casnedi, who regale us with stories and legends of the little fishing port that is now a premier summer destination. 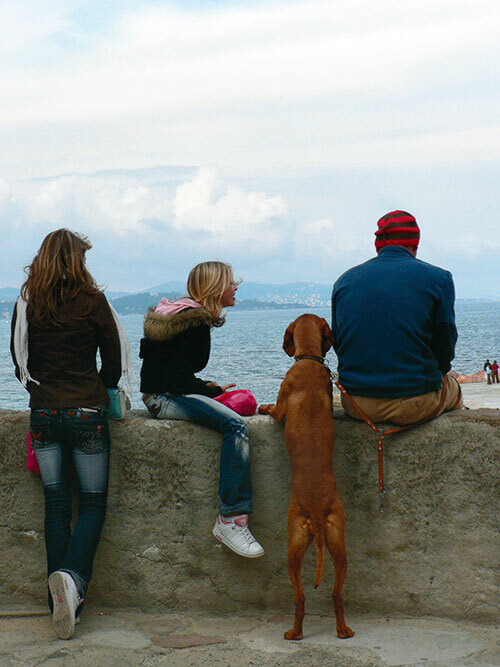 And lest I forget, may I mention that the local daily, Var Matin, was so taken up with Verve’s presence in Saint-Tropez that it put our picture on the front page! 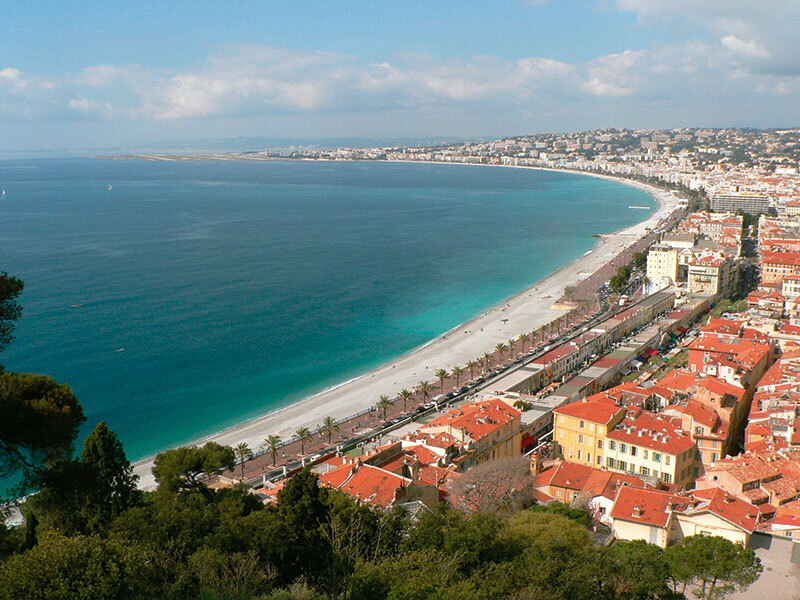 Air France, the award-winning, premium international carrier, has daily flights from Mumbai/Delhi to Nice Côte d’Azur International Airport via Paris. The high-speed TGV, with direct daily connections, also connects Paris and Nice in five and a half hours. 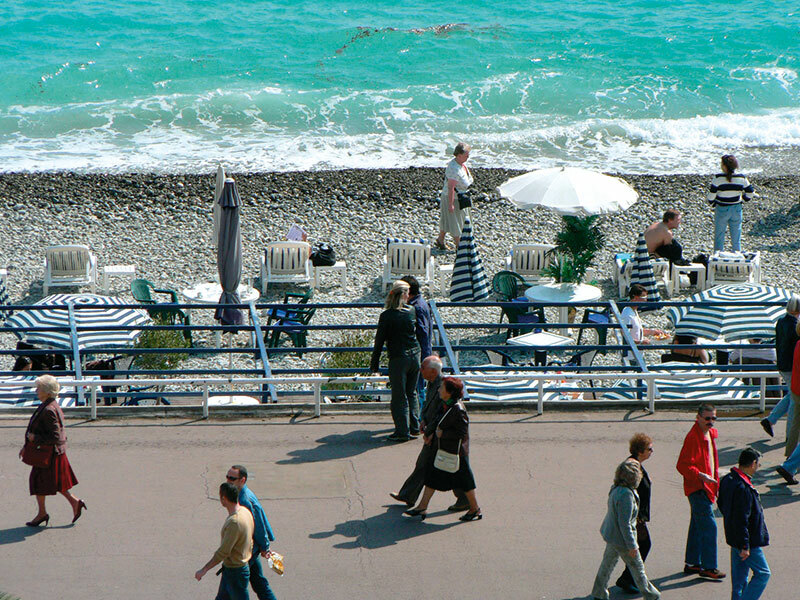 Scheduled bus, train and ferry services run between Nice and the neighbouring resort towns of Cannes and Saint-Tropez. Cars/mini vans can be rented from the airport terminals. Take-home buys: Black olives, Bellet wines, Fragonard fragrances, candied fruits.